Somerly Primary School students with the Moorditj Mob from Wesley College. 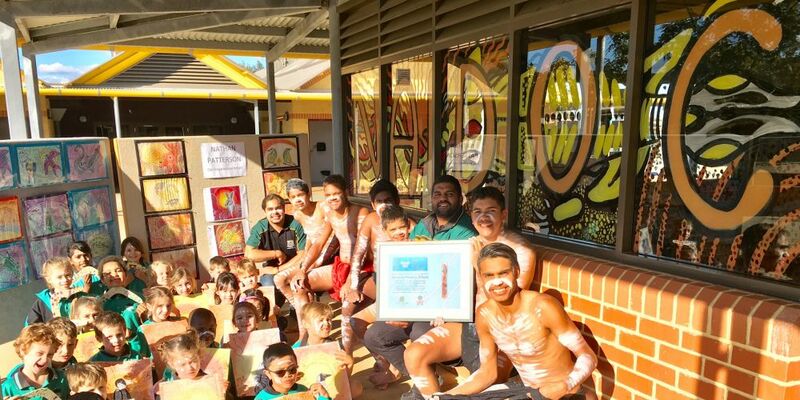 SOMERLY Primary School embraced Naidoc Week celebrations this term through music, dance and art activities. Art specialist Rhiannon Bartley said the Clarkson school welcomed the Moorditj Mob visitors from Wesley College who shared traditional Aboriginal storytelling through music and dance on June 23 and 26. “Moorditj means ‘excellent and strong’ in the Nyoongar language, and we wanted Somerly students to make the connection between understanding and valuing culture and maintaining strength and focus through high school,” she said. “The Naidoc theme this year is ‘Our languages matter,’ and the Moorditj Mob shared some Nyoongar words, as well as symbols used in art, didgeridoo music and memerising dances. Miss Bartley said students had also been exploring the artwork of Wagiman man Nathan Patterson, an artist who lives in Victoria. “Nathan creates powerful narrative artwork that incorporates the dreamtime stories of his people and land with beautiful light and energy,” she said. “Students have enjoyed observing the different animals in his artwork and finding connections between his stories and their own experiences.